That's interesting. Unfortunately, you need really large scale wind turbines for the technology to be worth while. No use for private projects, I think. The UK government has a particularly awkward policy for home generated Energy. They started with a system of Feed-In Tariff which involved all the other consumers paying for those who had enough money and suitable homes to instal PV systems. The FIT is too low to make it attractive and the firms that supply the systems are ripping customers off (afaics). It all started off as a vanity project for Tony Blair, way back. "The UK can do it better than anyone else". No use for private projects, I think. The thread is about offshore wind. Not much chance to do that privately in any country. Just curious on terminology, when they say "total installed capacity of about 760MW" is this the peak generating capacity or the expected output including predicted wind occurrence? They want to sell the damned things! So that cost per actual delivered MW/hr is a about 2-6x higher then? They didn't actually quote a cost per MWh in the article, but usually they'd bid based on actual delivered energy, not peak theoretical output. Based on the wind conditions at the site, the characteristics of the turbines involved, etc, you can figure out an expected annual energy production (AEP), and then the bids will be based around the expected AEP from the farm. The 760MW "total installed capacity" is peak output though. For a modern offshore 10MW turbine running at a decent site, numbers in the neighborhood of 40GWh/yr are pretty reasonable, so for a 760MW farm (76 of those turbines), you'd be looking at 3TWh/yr of production, give or take a bit depending on which turbine they select and the site conditions. Also, for offshore, capacity factors are typically 30-60%, so a factor of 2 is much closer to reality than a factor of 6. A lot of housing associations put solar panels on the roots of the houses they owned because it lowered fuel bills for their low wage tenents and provided an income for the association. That's pretty much stopped now the FIT has reduced/ended. It doesn't really matter what the cost per MW/hr is. Without a subsidy they will have to sell electricity at market rates along side fossil fuel plants. If they can't do that they go bust. Presumably they believe they can or they wouldn't build the wind farm. PS: It might be necessary to subsidize new gas power stations if wind prices keep falling.
. . . or were sold the idea by a clever, optimistic and enthusiastic salesperson. The Green Energy market will always be 'marginal' for consumers because the companies need only be a bit competitive to sell the products. This is an example of where governments could affect the situation but it has to be with legislation; fiscal pressure only has limited effect. What do you mean by that sophie? 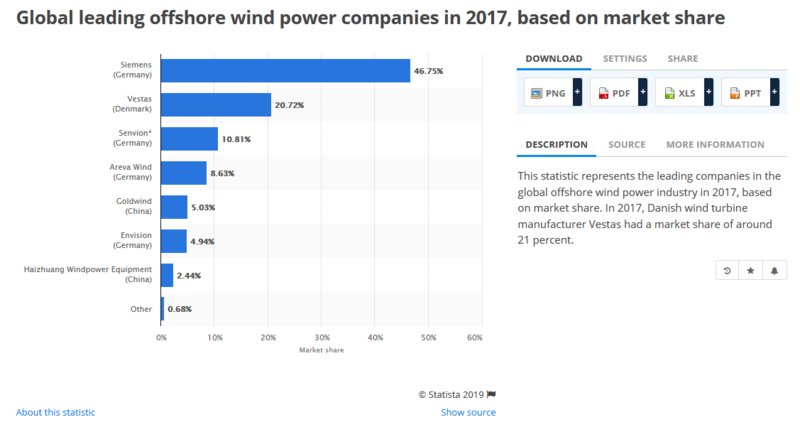 Wind power is very competitive right now, with pretty extensive price pressure for OEMs and a large number of new designs that have recently hit the market. Also, consumers really don't have much of an impact on it, unless you're counting utilities and large scale energy development companies as the "consumers" here - small scale wind is not even remotely competitive, and much of the price improvement of late has come from scaling up to ridiculously large machines. Even a small project is going to be tens of millions of dollars, minimum. What do you mean by that sophie? Bit more of a general rant, I suppose. As a consumer, I find that prices rise faster than they fall. I realise wind has to be big scale to be worth while. There is still the problem of Energy Storage which will always be needed with wind sources - even off shore. The size of the latest systems is eye watering though. Quite scary, even. Levelised cost of electricity (LCoE) from new offshore wind falls 24% in 2018. Ditto cost of storage down 34%..
reNEWS: Battery and offshore wind costs 'tumble'. The newest 12 MW turbines will help continue the downward trend. I'll be really curious to see how well GE can pull those off. They aren't much of a player in offshore wind right now, and all their experience previously was in a 6MW 150m rotor design that they didn't even do in house (they bought Alstom), and which also never sold particularly well. A 12MW 220m is a massive jump, and it'll be very impressive if they get it right, but they don't even have the prototype erected yet so it'll be very interesting to see (and if they do get the prototype working later this year, I'd love to go see it in person). Regardless, even if GE hits some unanticipated struggles, the general trend is clearly towards bigger and bigger turbines, with each generation pushing the cost per MWh down. Siemens Gamesa just released their 10MW 193m design (up from an 8MW 167m previously), and Vestas recently uprated their V164 (164 meter) turbine to 10MW and announced a 174m 9.5MW variant with new blades for that same model. Compared to even just 5 years ago, when the largest turbines were hovering around 6-7MW and 150-155m, the growth has been very impressive. DISCLAIMER: I work in blade design in the offshore wind industry, and I do not work for GE (as you may guess from my skepticism about their capability above). However, my opinions and statements here are my own, and do not represent the opinions of the company I work for in any way. I'll be really curious to see how well GE can pull those off. I also wonder about that product's future considering the demise of GE Power and sale of many GE businesses to others. Who owns that GE wind turbine business now? IDK on the GE criticism - they did originally buy the land based designs but the 12MW off shore in a totally inhouse design. They are #2 in the US ( Page 11), but 43% of the total installed base, and 3rd to 4th globally in annual marketshare - over the years they have developed a lot of experience. That's my point - the 12MW is their first in-house offshore design, and it's an incredibly ambitious design. To do so with almost no prior experience would be very impressive, but also very risky. Even their 6MW 150 that they acquired when they bought Alstom never sold particularly well - as you can see here (or in a more detailed report here), they have a negligible market share in the offshore market. Now, I won't argue about their abilities onshore. They've been a major player in the 2-3MW space for years now, and their new 5MW "cypress" design is very interesting (and I suspect will sell quite well). I don't mean to indicate that they have no wind experience, but there are some major differences in what makes an onshore design successful vs offshore. That also isn't to say that I'm hoping they fail or anything. I love seeing these big machines, and I'm always curious to see how different companies approach the design challenges. I'm just saying that a number of us within the industry have been somewhat skeptical about whether GE has the technology and experience to make an offshore turbine as ambitious as that one at an economically viable price. "Offshore wind power without subsidy" You must log in or register to reply here. Power dissipated without a load?